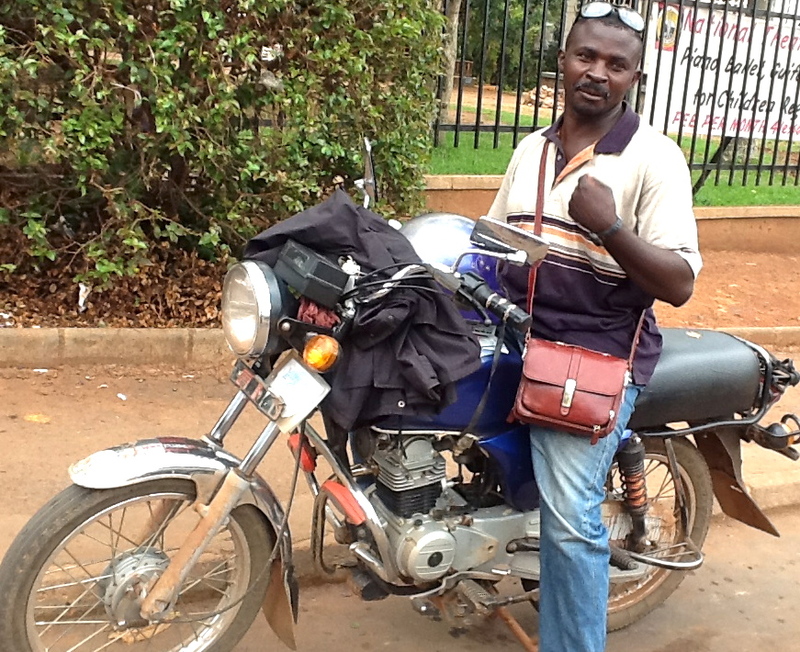 Bodaboda Baby: Is it a handbag or a 'manbag'? No, it's a bodabag. Is it a handbag or a 'manbag'? No, it's a bodabag. Would you take this bag on a boda? "Which handbag should I take on the bodas today?" As a passenger, it's a question I've asked myself over and over, often on the same day. With many dirt roads in Kampala, and bag-snatchers in operation (or so we're sometimes told) you may not want to be swinging your (fake) Fendi off the back of a motorbike down The Street of Death. Then what to carry? And should you carry a handbag at all? For a boda driver, I imagine this question becomes even more complicated. Should I carry a handbag or a manbag? (Going by some of the things we've seen bodas carrying recently, toting a handbag should be the last thing they're worried about taking). Boda driver Benjamin,33, however, knows what he wants. When he picked me up at the National Theatre on Saturday (I'd gone there to watch The Cut) to take me to nearby Garden City, he had this brown Futura number confidently slung across his shoulder. "I like your bag, Sebo (Sir)," I said straight away, causing him to giggle. "Others are saying it's for the women," he replied. "But I think it is smart." Benjamin told me that he'd bought the satchel at Owino market for 20,000 UGX only a month ago. When I posted his photo on Twitter, one friend, Danni (she visited Uganda earlier this year) declared the accessory was "straight off the catwalk. Utilitarian fashion at its finest." But several Ugandan men in the Twittersphere were unanimous in the verdict on the bag: no. "That's a lady's bag. Doesn't look right on a man," said Julian, a Ugandan expat now living in the UK. Would you buy this handbag, men of Uganda? However the most interesting comments came from Ugandan Norman Anguzu. Fashion aside, toting a handbag or man bag on a boda isn't necessary, he pointed out. My mzungu friend Jennie Penhallow, who lived in Uganda up until this summer, said the bag was "too girly to be a bloke's bag, not school satchel enough! Sorry boda driver", but another Tatenda liked it although said it needed to be "less shiny". "Neda nyabo (no madam)," Norman replied when asked if he liked it. "The pockets on my trousers are just enough to carry what a manbag would carry." "It's hard enough helping my girl out with her handbag." There you have it. The majority of Ugandan men may shy away from the handbag, but one has admitted that he helps his girlfriend with one. UPDATE FROM THE BODA KING, WALTER: Actually for me I carry a cross bag as my office. However, most bodas don't carry anything like handbags because they don't always need them. Also a handbag like that is mostly for ladies. The only time I would carry it is when I have a fiancé on the back, or a female client who is scared of thieves, especially while passing through downtown/chaotic areas. Sometimes if I see a boda with such a bag, especially at night, I begin to suspect that they have robbed it somewhere. Like from a pedestrian.